My young friend Jay who is visiting us again, and I were in a serious discussion about the state of this world because he is deeply involved in all kinds of peace and world unity movements. He should be at his age and I should not be at mine. I am allowed to be cynical because I have just lived a lot longer than he has and have seen a lot of nonsense that goes on behind scenes that idealists do not see, or, are incapable of seeing. When I suggested to him that we will never see peace in our world because of the vested interests of the arms and ammunition business and their tie ups with all establishments, he said that he has seen the Lord Of War and despite that will remain an idealist. I was intrigued and investigated to find that I could see the film on Youtube and did just that. And what a remarkable experience it was. I am glad that we have all these modern conveniences that enables us to see old films. This picture was released ten years ago when I was otherwise preoccupied and did not keep track of movies and among the many good ones I seem to have missed, this too turns out to be one with Nicholas Cage, one of favourite actors coming up with a satisfyingly professional performance. But this powerful message during the interrogation scene is the one that socks you in your solar plexus and leaves you breathless and in awe. And this is what I told Jay and for which he said that he was fighting such forces. The difference between an old man and a young idealist. 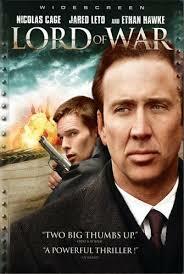 15 Responses to Lord Of War. I wish your young friend luck. I hope our cynicism is misplaced. We can hope, but I think that it is not. Gandhi got Indians to do what they do best. Nothing. That is why satyagraha worked. Had he asked them to rise in rebellion, he would have failed. I am afraid that the answer to your dilemma is yes, we can only be armchair pundits and pontificate and quietly pass away into history. Technology won over me and I could not adjust the sound to a sufficient level to hear. You got me interested though and I will try few things to see if I can hear the dialog that intrigued me. I just wonder about being an idealist in a mature age. I guess part of me still is. It may mean that I am slow on the uptake or stubborn or that I chose to see the world as a place that has potential for change. It is naive, I guess, but helps me to smile and hope. It will be worth your while Anna. Please do try through other links. I have won over technology. Yes, in the light of the scene, one looses innocence. Scary. Good for you! Yes, it is a powerful scene and more so in context. Please do try and see the film. Once they hit middle age, they give up Shackman. Remember the Hippies and the Beatnicks? At least you gently introduced him to the reality of evil. He has got other mentors too! Powerful piece of film Ramana, and I believe that a huge portion of the world’s economy rests on the sale and manufacture of endless war. We don’t know 10% of it…. I was shaken to my core WWW. Coming as it does at the end of the film and when it is totally unexpected, it socks you in your solar plexus. A picture that you must see. i am late in replying here rummy. i don’t even know it you’ll see it now. but thank you for that clip from the movie. it was chilling. it put to rest forever the flag and mom and apple pie thoughts. we are no less a monster than any of them. and only in the recent years have i begun to learn. why did i not see it before? didn’t WANT to i suppose. as simple as that. even back in 1961 president eisenhower warned us of the every growing military industrial complex. nobody listened. too much money in it. and power grabbing.